Do you love experimenting with different recipes? If so, you must have realized that a good number of them require you to use toasted sesame seeds. Well, sesame seeds are readily available in their raw foam; but do you know how they are toasted? Add a little fun to your cooking by toasting your own sesame seeds at home. In this regard, there are several methods that may be used to toast these seeds today. Discussed below are 2 of the common sesame seed toasting methods. Do not have all the time in the world to toast sesame seeds? Don’t worry; there is a faster, yet effective way of doing it. This is arguably the commonest methods of toasting sesame seeds today. This method is best suited for sesame seeds that do not have pebbles or dust. 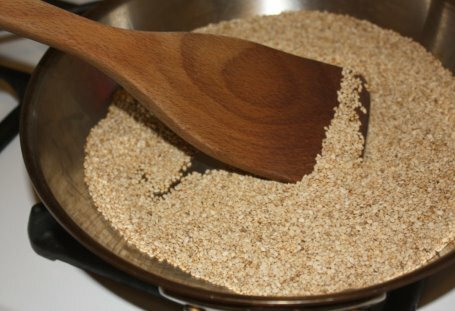 You should heat the pan or skillet over medium to low heat while stirring the sesame seeds from time to time. For this method, you need to heat the seeds for 2 to 3 minutes. By this time, the seeds will have turned brown. As you toast them on a stovetop, you should expect the seeds to glister and some to pop up occasionally. 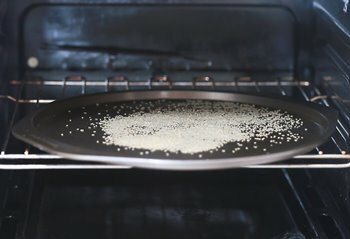 If you are using this method to toast sesame seeds, you are not supposed to add any oil to the seeds in the skillet or pan. Though quick, this method of toasting sesame seeds does not give the best flavor. If you would like your seeds to have a nuttier flavor, you need to try out the longer thorough toasting method discussed below. 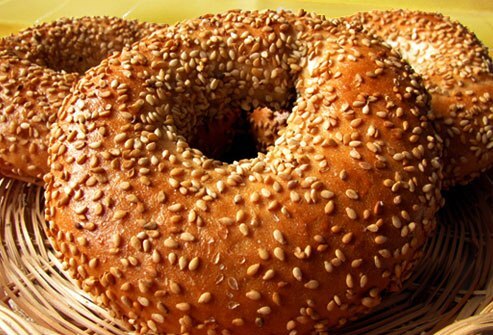 Another quick way of toasting sesame seeds is to bake them. While baking the seeds, you should stop to shake the pan every few minutes for enhanced heat distribution on the seeds. You also need to observe the seeds as they bake. If not checked, sesame seeds tend to burn very quickly. Once they are toasted, spread them on a cool baking sheet and leave them to cool down before you use or store them. As opposed to other sesame seed types, unhulled ones tend to give a unique flavor when toasted using this method. Although not necessary, you may also soak your seeds overnight prior to toasting to germinate them. Heat the seeds over high heat while stirring them occasionally using a wooden spoon. Once they are dry, you should reduce the heat to medium setting and continue to stir the seeds occasionally. To test whether the seeds have toasted, take a few seeds and pinch them in between your fingers. 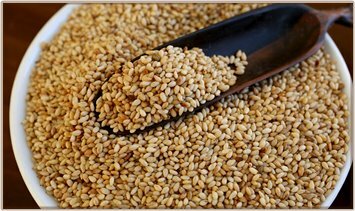 As opposed to raw seeds, toasted sesame seeds may be crushed into a powder and are known to have a nuttier flavor. However, the results will mainly depend on how well you toast the seeds. If you would rather toast the seeds faster, you may bake them or use a stovetop to toast them. However, the longer thorough method of toasting sesame seeds will give you the best results. As a matter of fact, seeds toasted using the thorough method have been proven to have a nuttier taste.